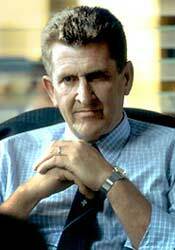 Ted Hudson is the chief of detectives at Kingsway. He’s a man who came up the ranks the hard way. He is a decent man, but a tough one. Canny and shrewd, Ted is a survivor. Richard has had an impressive film and television career spanning many years. Most recently seen in TEN’s Heroes’ Mountain, Richard also starred in the Australian films Rabbit Proof Fence, Idiot Box, Muriel's Wedding and Stitched. Richard has earned much praise for his roles in some of Australia’s most critically-acclaimed television including, Wildside, G.P and The Flying Doctors to name a few. Richard has also had a successful career as a stand up comedian, head-lining many tours around Australia and overseas. Richard plays gritty detective senior sergeant Ted Hudson in WHITE COLLAR BLUE.